The new sector weightings will be as follows (chart courtesy of LPL. Just for your reference here are the top-10 holdings of the ETF’s currently which will change on September 21st. I have highlighted the 4-FANG stocks. However, here is a full list of the stocks to be reclassified. As noted, the telecommunications sector is likely to become much more volatile. Furthermore, if you are benchmarking your portfolio, you will need to make sector weighting changes as well. Industrials and Healthcare were once again the clear winners last week. With the 50-dma crossing above the 200-dma in Industrials, the bullish bias is back in place. Despite the threat of trade wars and tariffs, investors chased industrial stocks looking for a rotation trade from overbought Discretionary and Technology sectors. Healthcare’s recent run continues but is grossly extended. These sectors are now extremely overbought, so take profits and rebalance weights back to target allocations. Look for pullbacks to the 50-dma to add exposure. Discretionary, Technology, and Staples – The trend higher in these sectors continues, and with the 50-dma crossing above the 200-dma in the Staples sector, our add to this sector earlier this year continues to perform well. Pullbacks to the 50-dma will provide better entry points in otherwise very overbought sectors currently. Utilities and Real Estate – continues their bullish trends but got impacted last week from the spurt above 3% in interest rates. 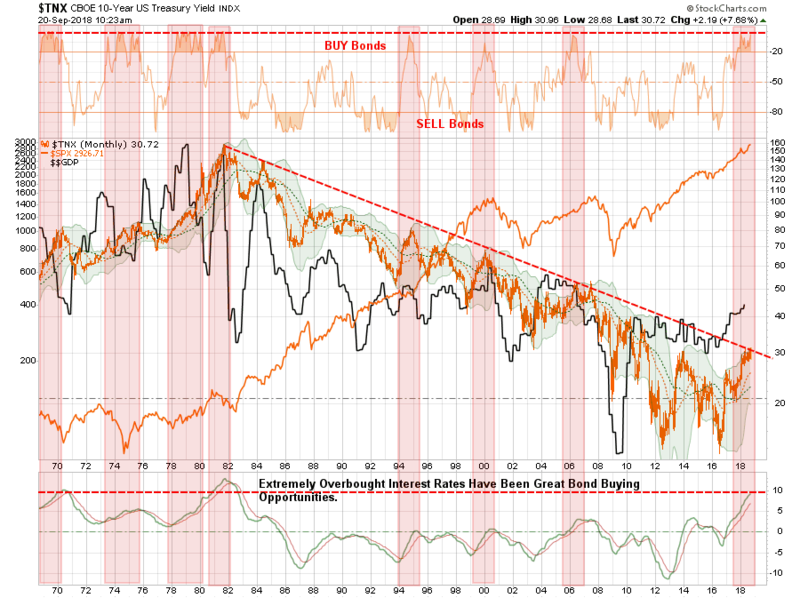 With investors back “chasing yield” the bullish trends are clearly in place. However, use pullbacks to support and oversold conditions to add exposure accordingly. 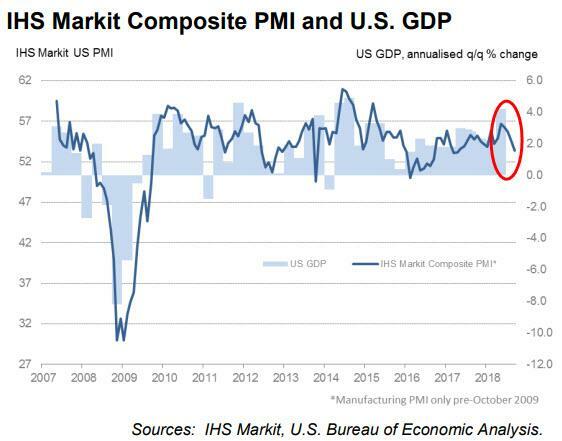 Financial, Energy, and Materials – continue to lag the rest of the market. Despite a recent tick up in oil prices, Energy remains in a downward trend currently. However, the 200-dma has been a good entry point for trading opportunities. Energy did break above the 50-dma last week, so a rally higher is likely if oil prices continue to rise. Stops should remain at the recent lows. Financials continue to languish along support but not showing much in the way of strength to support overweighting the sector currently. Materials finally broke higher last week as “trade fears” eased but news over the weekend will likely reverse this sector next week. Let’s wait and see what happens. Small-Cap and Mid Cap we noted three weeks ago that these markets were extremely overbought and extended, and a pullback to support was needed. Mid-cap has performed better but is short-term overbought. Small-caps have begun to work off their overbought condition as of late which is good and we will look for an opportunity to add exposure as needed. That advice remains the same this week. Dividends, Market, and Equal Weight – we added a pure S&P 500 index fund to our “core” holdings which will add some beta to the portfolio but acts as a placeholder for sectors and markets we have no allocation to (ie, international markets, gold, basic materials.) We continue to hold our allocations to these “core holdings” and continue to build around these core with tactical positions that provided opportunistic advantages. As noted in the sector allocations above, “the dividend chase” is “back” as the dividend index has sharply outperformed the broader market. Bonds – bonds sold off last week on the spurt in interest rates back above 3%. With bonds back on strong support at recent lows, and very oversold, we are looking to add bond exposure to our portfolios. We are moving our stop to $114 for trading positions. New clients: Added 50% of target equity allocations. Equity Model: Semiconductors (MU & KLAC) remain on “Sell Alerts” – we are monitoring these positions closely and stop-loss levels have been tightened up. We added positions in JNJ, CVS, NKE, FDX, DUK, PEP, and WMT. We also brought existing positions up to full weight where needed. There were no changes last week as the bulk of our positions are currently working as expected. However, as we have repeatedly stated, we are well aware of the present risk. Stop loss levels have been moved up to recent lows and we continue to monitor developments on a daily basis. With the trend of the market positive, we want to continue to participate to book in performance now for a “rainy day” later. With the move in portfolios back to full target allocations, there is not much for us to do right now except to remain on the lookout for the risks which could rapidly take away our performance. Continue using the following guidelines for now. If you are underweight equities – increase exposure towards domestic equity to levels where you feel comfortable. There is no need to go “all in” at one time. Step in on any weak days.